The 802nd Tank Destroyer Battalion was formed on 15 December 1941 at Camp Shelby, Mississippi. In April 1944, the battalion departed for the ETO, where it would participate in the Normandy and four other campaigns. The 802nd TD was inactivated on 1 December 1945, two days following its return to the States. 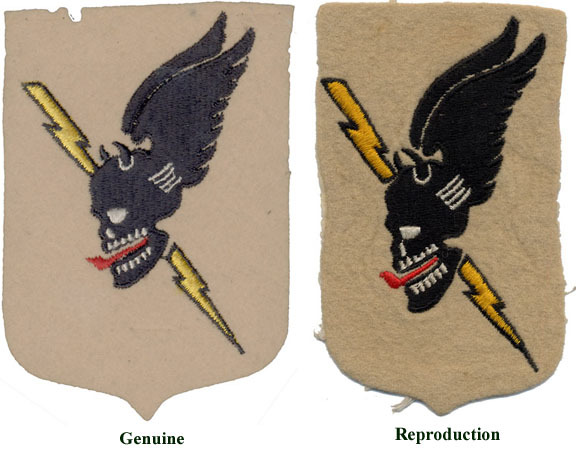 Circa 1943, while the unit was still training in the States, a patch was created for the 802nd. Though not authorized by the Army, the patch was approved for local wear while the battalion was in the States but not, according to veterans of the unit I've spoken with, while the unit was overseas. Many collectors and dealers have been fooled by reproductions of the patch of the 802nd. The following image illustrates, side by side, examples of a genuine patch and a reproduction (repro) that was made in the ‘70s. Following the image is a discussion of their differences. Noteworthy differences include: (1) the size of each patch relative to its embroidered design; (3) the genuine patch is wider; (2) the rough (fuzzy) surface of the wool base material of the repro relative to the smooth surface of the wool of the genuine patch; (3) the gap between the wings runs the length of the wings on the repro; (4) the lightning bolt at the top is closer to the nearest horn on the repro; (5) the end of the tongue is neither as distinct nor as pointed on the repro. I would caution against drawing conclusions regarding differences in colors from the above images. In fact, the lightning bolt of the genuine patch is a darker yellow than that of the repro, and the colors of the genuine patch are just as vibrant as those of the repro. Another difference that should be noted is the shapes of the skulls. Specifically, the jaw of the repro's skull is more pronounced, and the repro's skull is more elongated. The following images illustrate the latter. In the above, I have selected just the skull of each patch so that the width of the image is the maximum width of the skull and the height the skull's maximum height. The parameter I have used to characterize the skulls is their aspect ratio (A.R.) - the ratio of height to width (height divided by width). The advantage of using A.R. rather than height or width alone is that whereas height and width are affected by magnification, their ratio is not. The measured A.R. values show that the height of the skull of the genuine patch is 50% greater than its width, but the height of the skull if the repro is 76% greater than its width. That is, the skull of the repro is more elongated than that of the genuine patch, which is evident by inspection of the above images. Be warned that some individuals will trim a repro before selling it, as a single patch or sewn to an Ike jacket. And keep in mind that this is a rare patch. Your chances of encountering a reproduction far, far exceed your chances of encountering the genuine article. Shelby L. Stanton, Order of Battle: U.S. Army, World War II (Novato: Presidio Press, 1984).